Sparky David Knight wins national recognition in the Which? Trusted Trader Awards for 2016. Local Staffordshire electrician, David Knight, has proved to be among the brightest sparks in the UK following a nomination for the coveted Which? 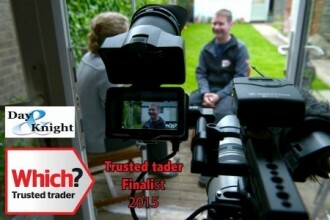 Trusted Trader of the Year Awards. David’s company, Day & Knight Electrical Solutions, is one of just a handful to gain a nomination for the prestigious award organised by national consumer watchdog, Which? “We have been a Which? Trusted Trader for several years and it is a fantastic brand to be associated with,” said David. As one of the top four finalists out of a total 6000 entrants, local customers can be sure that they will receive a top-notch electrical service. The final takes place at Kings Place London on 25th May 2016. The Which? Trusted Trader mark of excellence follows a comprehensive five-step process for traders to complete before individuals and companies are issued with the Trusted Trader status. A visit and interview conducted by Which? Which? openly admits to rejecting many trader applications to join the scheme because applicants do not perform high enough to meet stringent quality standards. Which? customers also benefit from an ombudsman service, which enables an independent resolution should any disputes arise. David Knight founded Day & Knight in 2003 to offer affordable and quality electrical services to residential and commercial businesses across Staffordshire. In 2015 the Stafford-based company transferred to a limited status and has just taken on its first electrician trainee. For anyone wishing to learn more about the domestic and commercial electrical services provided by Day & Knight Ltd, please call 01785 661199 or 07792 913566 today or complete the contact form here. 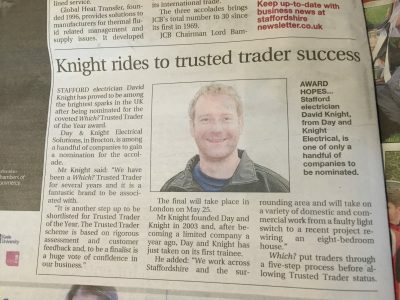 Further articles relating to Day & Knight Ltd’s achievement can be found in The Staffordshire Newsletter and The Sentinel. This entry was posted in Articles, Commercial, Domestic and tagged contact Dave at Day and Knight, day and knight electrics, electrician stafford, Which? trusted trader, Which? Trusted Trader Awards 2016.